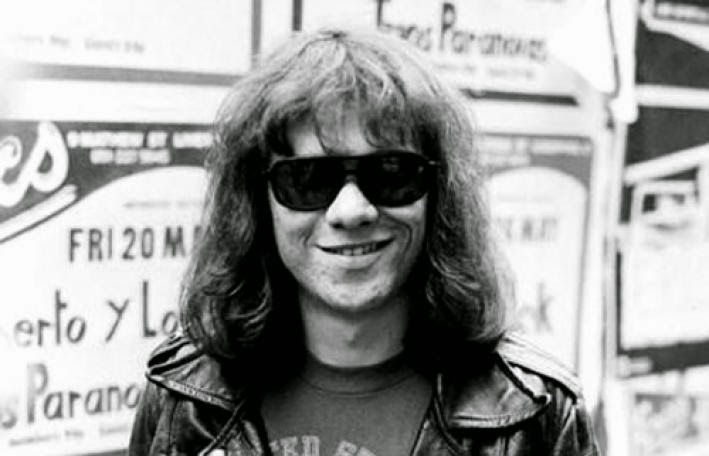 The last living original member of The Ramones, drummer Tommy Ramone, died of cancer yesterday. Thomas Erdelyi was born in Budapest Hungay in 1952, his parents both Holocaust survivors. He was raised in Forest Hills, New York. He started his music and studio career at a young age, serving as an engineer on Jimi Hendrix' Band of Gypsys record (1970). Joey Ramone was The Ramones original drummer when they first got together in 1974, and Tommy was their manager. But Tommy had to take over on drums when Joey couldn't keep pace with the increasingly fast pace of the songs they were writing, moving Joey out front to sing. Tommy left the band in 1978 (replaced by Marky Ramone), though stayed around to produce Road to Ruin and later Too Tough To Die (1984). But The Ramones sound and legend was made on their brilliant first three records, all featuring Tommy on drums and as co-producer -- Ramones, Leave Home, and Rocket to Russia. So The Ramones are all gone, which makes me feel both sad and old. Hard to believe every Ramone is now gone while every other member of the Rolling Stones has survived since Brian Jones' death 45 years ago. I can't imagine any new band coming along now that would so turn everything upside down like the Ramones did in 1976, such equal parts anarchy and exuberant fun. Recording and performing as King Post Kitsch, Glasgow-based musician Charlie Ward has released several EPs and two albums, 2011's The Party's Over via Song by Toad Records, and this year's Sheep On A Beach via New Pleasure Recordings. Charlie has generously created this free sampler of his music so fans and potential fans can sample his art. Personally, I find his brand of garage rock to be raw, but intelligent and compelling. I highly recommend that you download the sampler, and then seek out the recordings from which the songs were culled. You may find some new favorite albums. Glasgow's The Vaselines have exhibited more staying power in this century than the last. Their much revered debut Dum Dum was released in 1989 just as the band was dissolving. However, Eugene and Frances reformed for S With An X in 2010, and October of this year will follow up with V For Vaselines. Always irreverent and naughty, and with a keen understanding that rock music requires the right mix of melody, noise and attitude, I'm very much looking forward to what they have cooked up for this album. You can take the latest edition of The Vaselines out for a test drive with "One Lost Year". They aren't kids anymore, but they haven't lost their edge. The year was 1967 - psychedelia in full bloom, Sgt. Pepper's Lonely Hearts Club Band, Vietnam, a raging generation gap, chaos in Western society at many levels. Meanwhile, inside the Rolling Stones' world, there was a heavy use of psychedelic drugs, drug busts, a lack of focus, a desire to keep up with The Beatles, and the severe decline of Brian Jones as a contributing member of the band. All of which led to, what was by many reports, the very messy making of Their Satanic Majesties Request, a record that Keith Richards much later referred to as "a load of crap". I found the self-titled debut from LA's psych rockers Allah-Las to be among the top albums of 2012 (review here), so I'm happy to learn that their second album, Worship the Sun, will be released in September. In advance of that album, Innovative Leisure is releasing the single "501-415". The record consists of the title track and a B-side instrumental "No Werewolf". You can pre-order the single from the label, and stream the video below. Allah-Las also are touring in support of Worship the Sun, and I've provided the dates below. Unfortunately for the Americans in the crowd, our Canadian brethren and Europeans get nearly all of the shows this time. I don't get it -- why play Barcelona when there probably is a good venue in Cleveland or St. Louis? I also want to take this opportunity to again plug Reverberation Radio. It is a weekly stream of excellent, and often obscure, pop music curated by Allah-Las and their friends. A new stream is published every Wednesday, and I never miss one. The link is here. Most of us have a sweet tooth, but most of us also want to look good on the beach. And we all know that too much candy can make that impressive set of abs turn into one, big, soft "ab", and that isn't anyone's idea of an impressive beach physique. Since you turn to When You Motor Away for answers, our suggestion is give up real sugar for ear candy. And may we suggest something new? Something that has the hooks, fuzzy guitars, keyboard accents and female vocals that we associate with the finest ear candy, but from a fresh young group? Excellent! We suggest you try the Jumprope EP from New York's Gingerlys. With four songs spanning bright dream pop ("Jumprope"), noise pop with jagged edges ("Summer Cramps"), propulsive C86 stylings ("Better Hearts"), and hazy summer beach pop ("Set You Off"). You can stream all of the songs below. If I were going to choose just one, I'd choose "Better Hearts", but I really wouldn't like to choose just one. For a band so new, the performances are satisfyingly tight, and Maria's vocals are a seductive force of nature. The songwriting is excellent and the package from Shelflife Records is typically attractive and tasteful. So, I assume you are interested. Here is the tricky bit -- this record has a limited run of 300 vinyl copies (with digital download), it went on sale two days ago, and as of last night only 60 were left. So your lo-cal ear candy problem is solved only if you can manage to hit some links. We have confidence that this diet will work for you -- you can do it. Gingerlys are Matt Richards (guitar), Maria Garnica (vocals, keys), Colin O'Neill (guitar), Kevin Doxsey (bass), and Brian Alvarez (drums). In late May we covered the latest album from Vermont's Colin Clary (link). In that post we also noted that the fine indie pop label WeePOP! was shutting its doors, but not before releasing three final records. Colin's Twee Blues Vol. 1 was one of those three, and the final release is out today. And what a great closer it is! Paperclip Chains by Let's Whisper is a achingly beautiful set of introspective guitar pop in the tradition of The Lucksmiths. If you listen carefully and think you hear a bit of Colin Clary's twee pop, you aren't mistaken, as Clary is a member of Let's Whisper, along with fellow New Englanders Dana Kaplan and Brad Searles. Clary and Kaplan, who also are members of The Smittens, started Let's Whisper a decade ago to showcase their softer songs. Searles was added later to keep time. They previously have released two EPs and a full length album. Apparently some of the material on Close As We Are was being prepared for a split 10", but the project grew to fill its own record. Since their isn't a weak song among the eight tracks, the decision to turn it into and album is a plus for us pop fans. With delicate but memorable melodies and sweet harmonies, these songs are tailor made for falling in love. But even if you already have tied the knot with your soulmate, you can sit in the grass and enjoy these songs together. The album opener, "Paperclip Chains", is a great place to start. And speaking of enjoyment, this record is a limited run of 300 vinyl copies, so you are hereby warned of limited availability if you procrastinate. 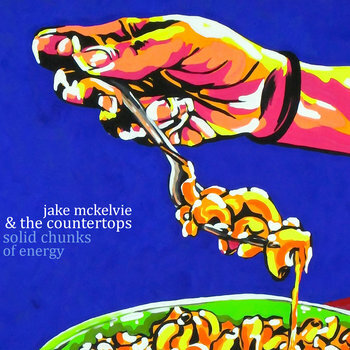 We haven't really been hijacked by Jake McKelvie & the Countertops, but we are promoting their music for the second time this week (earlier post here). We offer no apologies, it is good music and it priced very attractively at 'name your price'. Today's feature is their May release, Solid Chunks of Energy. And yes, it is solid chunks of energy, a bit dose of humor and even a little music! A great deal for everyone. Own your very own countertop. And if you acquired a countertop earlier this week, you can now have a matching pair. What a great country! Comet Gain can boast of a 20 year span of writing and recording, and with Paperback Ghosts, seven albums of expertly-crafted guitar pop. No slaves to genre, frontman David Feck and his collaborators trod the paths of folk rock, garage and even country as required by the song. What is constant, however, is Comet Gain's ability to deliver a song in an efficient and emotionally affecting manner. What makes a band so good, so damn vital, over two decades of production? You can make your own guess, but I think that, in addition to the obviously necessary musical talent, it is a commitment to vulnerability and emotional sincerity, and an innate feeling for poetic expression. The songs have love, rejection, regret, anger, and melancholy. There is no trepidation about examining wounds and facing travails, but no excess weeping or self-pity either. And the lyrical presentation is simple, but powerful. If I were to tag this band with a philosophy, I'd call them 'romantic realists'. Paperback Ghosts consists of twelve tracks, with a balance that shifts more to autumnal mid-tempo than ramshackle rockers with which long-time fans of the band are familiar. But for all the reasons noted above, the pace of the album feels perfect, and tracks such as "Breaking Open The Head Part I" and "(All the) Avenue Girls" show that Comet Gain can easily still ramp up to roof-raising performances. In an album of fine songs, I've chosen three, "Sad Love And Other Short Stories", and "(All the) Avenue Girls" (which was previously released as part of the fine wiaiwya-7777777 singles club), and album opener, "Long After Tonight's Candles Are Blown". Paperback Ghosts manages to tug on your heartstrings, make you smile and affirm life, and that combination is a winner for me. Comet Gain are David Feck (vocals/guitar), Ben Phillipson (guitar), Rachel Evans (vocals), Woodie Taylor (percussion), Anne Laure Guillain (keys), and James Hornsey (bass). Paperback Ghosts is available now from Fortuna POP! on vinyl with digital download and CD. Beverly is getting press for the quality of the music on Careers, as well as the partnership of Drew Citron with Frankie Rose to comprise the group. Regarding the latter, it isn't surprising that Rose's decision to team up with the Avan Lava member is a talking point. Rose has carved out well-deserved indie pop fame since she left Vivian Girls to launch her solo career, and we count ourselves among her fans. But the story here, I think, must include the quality of Citron's songwriting to convey a specific atmosphere as well as the collaboration with Rose. Rose contributed vocals, energy, arrangements and perhaps her skills on the drum kit, but if I understand correctly, the songs are Citron's and the live performances in support of the album will be Drew Citron and additional live members, and Frankie will return to her day job as, well, Frankie Rose. However that all sorts out, Careers is a breath of fresh air. Specifically, a delightful summer breeze. There is fuzz, wonderful vocal interplay between Citron and Rose, and an obvious love and respect for the classic guitar pop song. The astute listener may detect a few different influences, but to my ears the album is what might have happened if The Clean had been women with a love of beach pop and a collection of Pixies and Breeders records. The overall vibe is seasonally-adjusted for summer relaxation. Upbeat hazy melodies are punctuated with sugary vocals and heart-tugging hooks, and there is little urgency (although "Planet Birthday" and a couple of other tracks ably demonstrate the band's ability to rock out). And there is plenty of variety, including noise pop, C86, and post-punk rockers. But whatever your preferred style, this is an album to sit back and enjoy as the sounds, especially the vocals, massage your ears. Careers is out now via Kanine Records. At first listen by a pop music fan, Donovan Blanc may appear to be the result of careful and supremely knowledgeable selections from the one of the worlds most complete collections of good but obscure vinyl from the '60s. It is a stellar set of blissed-out, psychedelic guitar pop with some surf and Brazilian touches at times, and our music fan likely would search for the liner notes to discover what long lost bands wrote such timeless music before becoming suburban dads, coaching baseball and selling insurance, writing wills or teaching history to high school students. The surprise awaiting this fan is that Donovan Blanc is not a collection of old songs from various groups, but the debut album from Joseph Black and Raymond Swab. And the New Jersey duo, formerly playing fuzzy pop as Honeydrum and now calling themselves Donovan Blanc, have announced their new venture via what may be the most irresistible record of earworms to be released this summer. The album is packed with delicious tunes. We previously featured the Brazilian influenced "Minha Menina" and the jangle pop "Hungry A Long Time", so we won't repeat them here. But I can't resist offering you a few more streams. Below is the jangling "Can't Wait To Meet You", which sounds like it should have been on the charts in '66, the gentle "Girlfriend", and "Oh Donna", a sure candidate for the last dance of the evening at the school dance. These are the kind of pop songs that seem like they've always been with you, and you'll always be happy to have them. Donovan Blanc is out now via Brooklyn's Captured Tracks. As Jake McKelvie and the Countertops wrote earlier in this holiday weekend, "freedom isn't free, but our music is". The only thing I can add to that generous offer from the musical Keene, New Hampshire kitchen surfaces is that you are really should go to the Bandcamp link and download this album. These songs are good storytelling with simple, hummable melodies and lo-fi, scruffy charm. I've provided a couple of streams below, but you can listen to the entire album on Bandcamp. The band members are Jake McKelvie (guitar/vocals), Nick Votruba (bass), and Matt Bacon (drums), although other players lend their talents from time to time. CastleRays is a new project consisting of vocalist Tara Simmons teaming up with producers YesYou. After the earlier release, "Body Hum", the gang have collaborated on "Be Me Lover". This may be a team made in heaven, but it certainly is made for the dance floor.